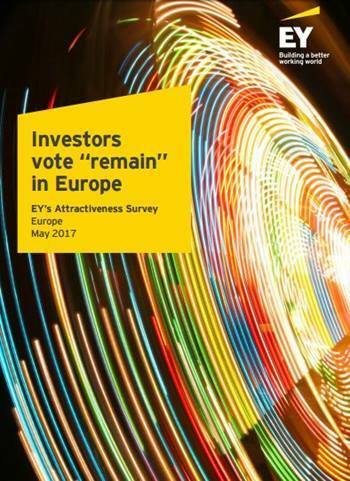 Every year, this annual study, unique of its kind, provides powerful insights for foreign investors, policymakers, citizens and all who care about the future of Europe. This year’s edition could hardly be more pertinent. Today, Europe is profoundly uneasy. Consensus about our common future has broken down, politics has fragmented and many things we took for granted are being called into question. Public debate often seems mired in the received ideas of yesteryear. Yet business executives making hard-nosed business decisions about where, how and when to invest have continued to opt for Europe. In 2016, we found, international investors launched more projects in Europe than ever before. In pursuing Europe’s opportunities, they are creating a quarter of a million jobs. Why? What gives them such confidence? Economic trends and data show that much of Europe has returned to steady, if unspectacular growth. Europe’s expanding markets, and gently falling jobless numbers reassure investors that Europe is working, albeit imperfectly, unevenly and unequally. The outlook is brightening. The European Commission has upgraded its forecast of Eurozone growth this year to 1.7% and is forecasting 1.8% next. Netherlands voters rejected the far right, and France has a new, young president committed to reforming both France and the EU. Aided by low interest rates, in 2016 companies stepped up their investments in the powerhouse economies of northern Europe – whose companies in turn continued to invest energetically beyond their borders. US companies also remained faithful, while reluctant to pay heavy taxes on repatriated profits. Investors also returned to southern Europe, encouraged by signs of belated recovery, and especially to Central Europe, where they find an attractive combination of good skills and affordable costs. Measuring against other regions of the world, where uncertainty has also increased, they find Europe relatively attractive. Though aging, it has a big market, increasingly homogenous in standards, geography and consumer tastes. Its sophisticated industrial, services and transport infrastructure make expanding here relatively easy. They find here the talented, educated, productive employees they need. New technologies, including artificial intelligence, robotics, and connected objects; in biotechnology, nanotechnology and so on, are creating opportunities to overhaul business models, operations, products and services. That’s driving renewal, though productivity benefits seem slow to appear. Companies have a broad vision of Europe’s performance, captured through their order books. They see opportunities and disparities: some countries, cities and people are doing much better than others. The encouraging news from our study is that amid well-founded concerns, some things are going right. So, companies, policymakers and citizens must come together, to better understand and recognize Europe’s economic success, and to reinforce its foundations. We hope our report will contribute to this process. We would like to thank all those – investors, policymakers and EY member firms’ partners, who have given so generously of their time and insights to make it possible.